The mobile app market strides setting new challenges for developers who are seeking cross platform development solutions able to cover both desktop and mobile projects. HTML5 is constantly gaining gound as app developers’ favorite. 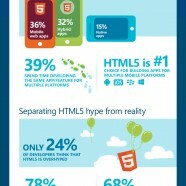 Here is a breakdown of how developers use and see HTML5.